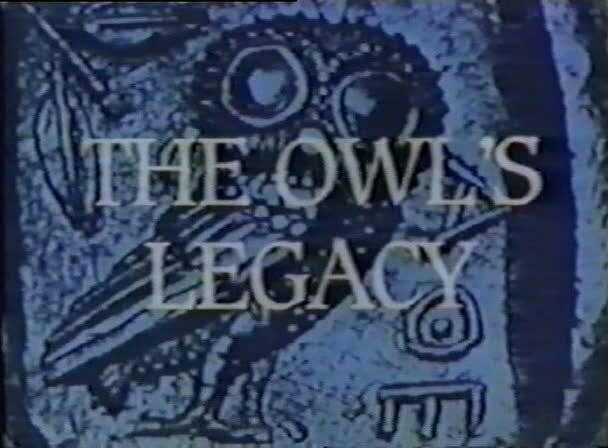 Chris Marker’s epic series The Owl’s Legacy (1989) is neither a deeply ‘auterist’ work nor a brilliant piece of Cinema. It is, plainly, the documentation of a thirteen-part symposium on Ancient Greece enabled by the Onassis Foundation and conceptualized by Marker. However, the amount of ground it covers and the number of new directions it opens up for us to think about contemporary politics, science, culture, law, economy and art (specifically, cinema) makes it one of the richest works of criticism that I’ve come across. It is extremely unfortunate, then, that it is neither available on video officially in any form nor spoken about really widely. Following a slew of earnest mails (OK, two mails) asking me if there was any site where the film can be viewed online with English subtitles, I decided to upload the copy I have of the entire series. Of course, all credits go to the original uploader who floated TV rip on the internet. It is because of people like her/him that the Internet has turned out to be the greatest repository of culture, globally. The last episode has about 10 minutes missing at the end. I will update the segment once I get the full version. If you have a copy of the full final episode and are interested, please upload and place a comment here. I will add it to the post. Meanwhile, you can watch the full series (including the full last episode) in French at Gorgomancy. Thanks very much for drawing attention to and posting this. I hadn’t heard of it. I quite liked Sans Soleil and La Jetee. I liked Chats Perches more. Personally I cannot see any particular moral problem given that it is not available for sale. I think it’s good that people get to see it and perhaps the more publicity it gets the more likely that it will be released in a finer version in the future. I will come back when I’ve watched it through. Thanks. True that, Stephen. But I don’t know if some group holds the rights without releasing it on video or some such complication. But I’ll put it up as long as no one objects. Astounding cinematic scholarship and a Hall of Fame caliber presentation Srikanth! Like Stephen I know Marker’s work for those two seminal films. But I wasn’t aware this even existed and by a modest scan of these you tubes, I found this a prospectically fascinating work, even if it is not (as you contend) any kind of a brilliant work of cinema, not a ‘deeply auturist’ work. I am most interested in all cultural aspects of ancient Greece, and fill applaud your decision of upload the entire series here! Thank you, Sam. DO see this series when possible. I saw this one over 2 years ago, along with many other Marker films. I need to revisit it as well. Marker is my favorite French filmmaker of all time (this probably even includes JLG!). And it’s sad that most of his great films – LETTERS FROM SIBERIA (the way reconfigures pushes the cine-diary must just be seen), THE OWL’S LEGACY, GRIN WITHOUT A CAT, BE SEEING YOU (a truly remarkable work that most radical films fail to emulate), THE TRAIN ROLLS ON (a deeply extra-textual masterwork), LEVEL FIVE, and, of course, THE LAST BOLSHEVIK (one of the four or five greatest films of the 90s) – remain relatively underseen, like the director himself. Sure hope this changes. 1. Please make the files *downloadable* on viddler (or upload them to vimeo, youtube or another site where one could download them). 2. Alternatively, enable the HTML5 Viddler embed option (you currently have the embed code set incorrectly, and no html5 videos play). I am an iPad user who would like to be able to view these without being shackled to the flash player. Plus there would be an added element of permanence to their existence if some of us could archive a copy. I’m not seeing anything different (no downloading or html5 video playing). If you enable downloading of the viddler files you see a disk icon and “download this” next to the “flag” and “share” options below the video. Sorry for the mix-up, Bez. I’d changed a setting that affects only new videos. I’ve manually changed the download setting now. Hope it’s fine now. I’ve a feeling that you’d be able to download these videos only if you have a login at Viddler. I don’t think Viddler allows you to download without signing in. Would be helpful if you could confirm. If you click on the “download this” icon/button you’ll see the file is available to download in “Original, Flash, FlashHD, MP4, MP4 HD and 3GPP”. You don’t have to be logged in to download either. Barring an oversight of one of the steps listed above, perhaps this is a setting that has to be chosen at the time you upload. Maybe it’s not available posthumously. An attempt to upload one of the files again with the sharing/downloading settings enabled would test this hypotheses. Your efforts in this are greatly appreciated. Perhaps it’s the point at which a viddler alternative should be found? Rapidshare, Dropbox, Vimeo, or dare I say bittorent. Thanks for that update. I’ve checked that I’m doing the right stuff. And yet… I guess it’s just a posthumous thing, as you point out. The series IS available for download at a number of torrent and filesharing sites. I’d uploaded it specifically to a video sharing site for thoseunfamiliar with such obscure sites and those who do not want to download files separately and instead just want to stream the videos. And I’d chosen Viddler because it was the only option (then) which allowed me to upload long videos and didn’t have an upload limit. Viddler does seem like the best choice of those available. And, hey, it does work for most use cases! I am more the exception than the rule, at least for now. I have tried to access the files at the link you shared (worldsofcinema), but they don’t work. You either get an error or they require a pay account (they also seem to be the French language versions, rather than the english ones you have posted here). Since I don’t have access to karagarga or any of the other secret sites out there, I guess I’ll just wait and hope that someone sees this and comes up with another option in the future. As a last option, I’ve individually enabled the embed option for all for every video. I can access the embed link even when I’m logged out. Hope this works, at least. Thanks to JAFB for all the help (and patience). Thanks Bez… I think the srt files are missing for episodes 12 and 13 though… anybody know where they might be found??? Truly an extraordinary series. The collective intelligence , the mere recording of it, is like finding ancient tablets were we find inscriptions of mind processes that enable us, like one of the interviewees says, to “know ourselves”, to try to figure out the labyrinth, and finally take that third path that leads to the mysterious unknown. As a filmmaker I welcome the abundance of ideas, the brainstorming and the innumerable seeds planted through this, and other Marker’s works, thanks for making it available, I was unaware of its existence. Right you are, Sunithaya. Essential stuff. My pleasure.